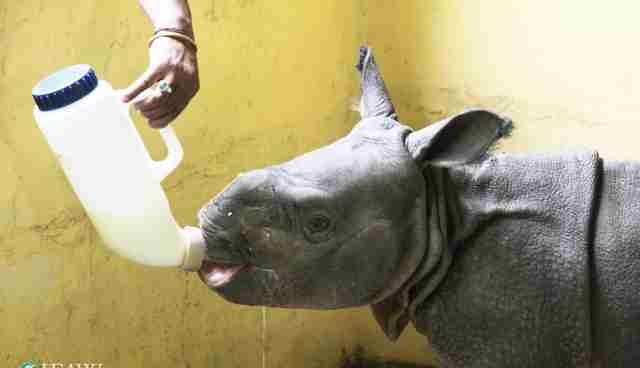 A 3-month-old rhino was trying to swim across rushing waters in northeast India this week when people spotted him. He was trying to reach his mom. Rescuers brought the little rhino by boat to dry land, and transported him to the International Fund for Animal Welfare (IFAW) Wildlife Rescue Center on Wednesday. Millions of people have been displaced and several have died after heavy monsoon rain and flooding wreaked havoc in the area. And India's precious wild animals haven't been spared from the disaster. "The calf is highly stressed," said Dr. Panjit Basumatary, the lead veterinarian at the rescue center. "After two unsuccessful attempts, he is now responding to oral rehydration and milk formula." The baby was placed under 24-hour observation in the nursery to make sure he stabilizes. "Under ordinary circumstances with young individuals, attempts (some lasting for weeks) are made to reunite them with their mothers, before they are considered subjects for long-term rehabilitation," Gail A'Brunzo, wildlife rescue manager for IFAW, told The Dodo. "In this case, the rhino was being swept away by floodwaters and no reunification was possible. 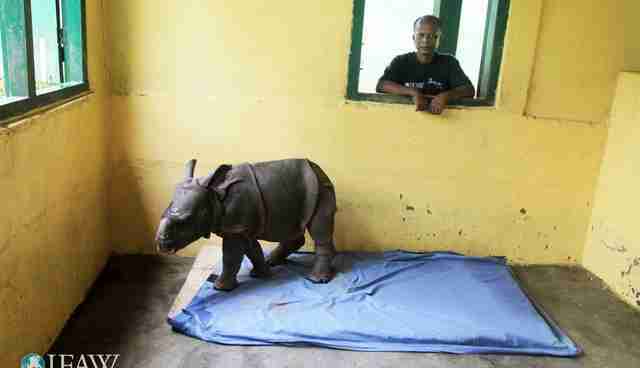 Should all continue to go well with him, he will be rehabilitated until he is old enough and has the skills to survive in the wild." 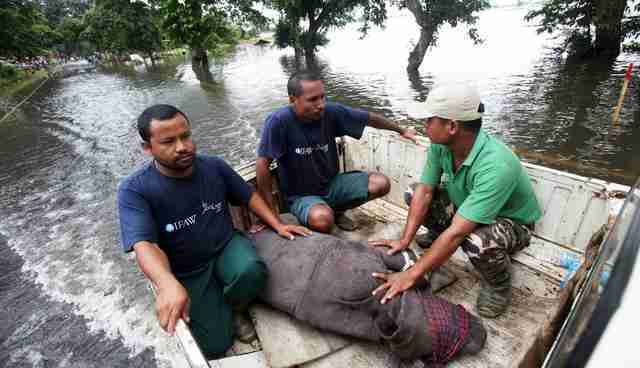 This dramatic rescue is just one of many occurring right now in Assam, India, where Kaziranga National Park, home to Indian rhinos, elephants and other animals, is being deluged by record-setting monsoon floods. 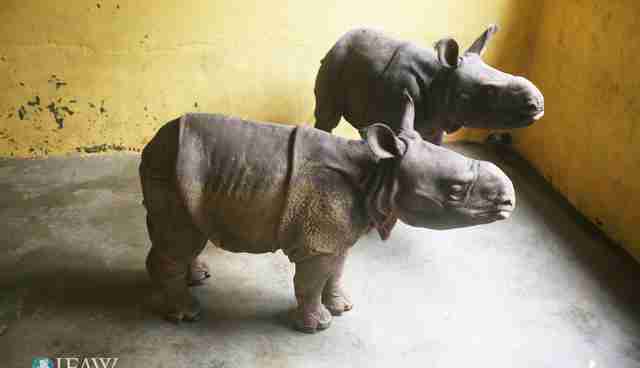 Eight other rhinos rescued from the floods are currently being cared for by IFAW, which is calling the flooding of the Kaziranga National Park a "major wildlife crisis," describing the floods as the worst in a decade. Some research has linked the worsening rains to global warming. The flooding has increased since the 1970s, when global temperatures started steadily climbing. The floods in the Assam region have already killed at least 21 people this year. 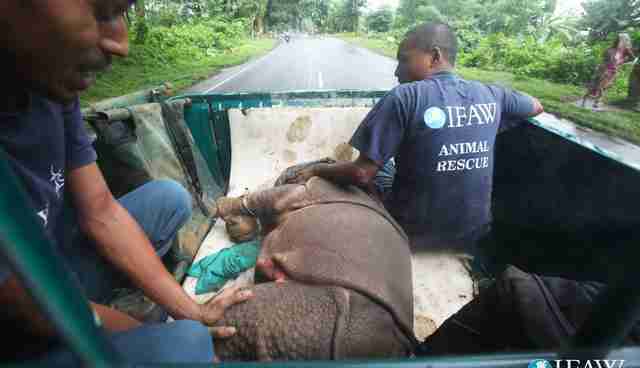 Click here to donate to IFAW's rescue efforts.